Te anexo la foto del reloj para visualices las piezas faltantes. Esperando su pronta respuesta quedo a sus órdenes para cualquier duda o aclaración. 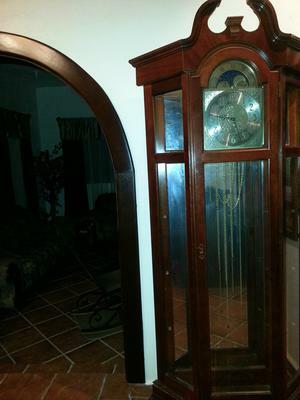 I bought a Ridegway Richardson I Curio Grandfather Clock but it lacks the pendulum and weights that go on the front, it also lacks the handle to open it, I would like to know the cost of these pieces and how I can get them. I have attached a photo to visualize the missing pieces. Waiting for your prompt response I am at your disposal for any questions or clarification.